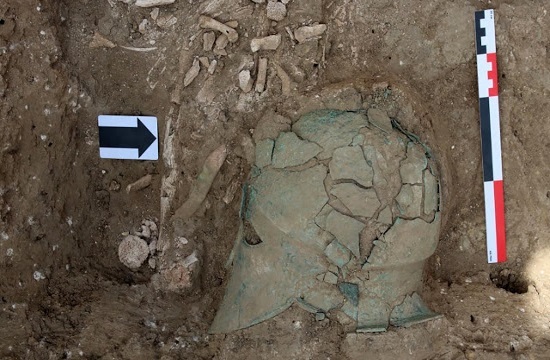 A Corinthian helmet was discovered in a 5th century BC grave in the Taman Peninsula, southwest Russia, according to RIA Novosti news agency. Made of bronze, Corinthian helmets covered the entire head and neck, with slits for the eyes and mouth, protruding cheek covers (paragnathides in Greek) as well as a curved protrusion in the back to protect the nape of the neck. Often their crest was surmounted by a crest (lophos) with a horsehair plume. The one found is corroded and highly fragmented, but its discovery is extremely significant for historical purposes. The Corinthian helmet is the only one of its kind discovered north of the Black Sea. Corinthian helmets appeared in Greece around the 6th century BC and constitute one of the symbols of ancient Greece. Goddess Athena and Pericles, are frequently depicted wearing them. When a warrior died, his helmet would be buried next to him. According to Roman Mimohod, director of the expedition of the Institute of Archaeology of the Russian Academy of Sciences (IA RAS), “the helmet of the Taman peninsula belongs to the Corinthian Hermione-type and would date back to the first quarter of the fifth century BC,” an Archaeology News Network report notes. 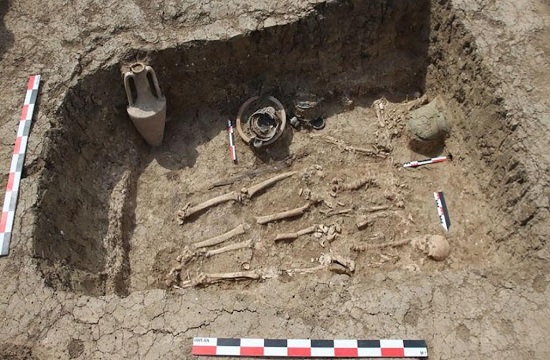 For two years now, Russian archaeologists study a necropolis of 600 burial mounds where many Greek warriors of the Bosporus kingdom are buried. Several Greek colonies were established in the region and their settlement extends from the end of the 7th century BC until the second quarter of the 4th century BC. The Greeks founded large cities on the northern coast of the Black Sea. The major ones were Olbia, at the mouth of the Dnieper; Panticapaion, today’s Kerch, in the extreme west of the Crimea, and Chersonese (Sevastopol); on the Russian bank, one found Phanagoria (Taman), also the name given to the peninsula on which the Corinthian helmet was discovered. According to the Archaeology News Network report, the Kingdom of the Bosporus was established in 480 BC around the Kerch Strait and the Taman Peninsula, west of the Bosporus. “These settlements were in very close contact with the Scythian inhabitants of the steppe,” points out historian Iraoslav Lebedynsky, specialist of these ancient Eurasian cultures. From the 6th century BC, the Greeks founded large cities on the northern coast of the Black Sea. The main ones were Olbia, at the mouth of the Dnieper; Panticapaion, today’s Kerch, in the extreme west of the Crimea, and Chersonese (Sevastopol); on the Russian bank, one found Phanagoria (Taman), also the name given to the peninsula on which the Corinthian helmet was found. The kingdom, with Panticapaion as its capital, lasted nearly a millennium, the last written traces going back to the 5th century AD. It was a place where the Greek culture merged with the successive nomadic cultures of the steppe, be it the Scythians or the Sarmatians. Between the 6th and 3rd centuries BC, Greeks and Scythians maintained extremely close cultural as well as commercial ties.